Wow – it is amazing that it is mid-September already! It is starting to get chilly which concerns Matt because a) I don’t like to be cold; b) we don’t have a heater on the boat; c) there is still lots to do before we can go anywhere warm; and d) everything takes 6 times longer than it seems it should. Matt recently made a comment about how people are not joking when they refer to ‘modern conveniences.’ Here was our day today … The boys and I drove to a park where they rode their bicycles on a trail while I ran. There is a pond where we stop to feed the turtles and fish. We came back and had breakfast. The ice box was pretty cool because I re-loaded it with ice yesterday (Modern Convenience #1: electric fridge; we have an ice box that needs to be loaded with about 30 pounds of ice every few days which I buy at the store and then put in a handcart and wheel down the dock to the boat – hoping I don’t fall off the dock while heaving the bags into the cockpit). Most people use the marina bathroom rather than the one on their boat. We use ours only in the middle of the night or if the boys need to use it early in the morning. The tank was full so I walked to the marina and scheduled someone to come pump it out (Modern Convenience #2: flushable toilets connected to a sewer system). One of our current tasks is to assess the anchors and their chains and see what must get replaced. 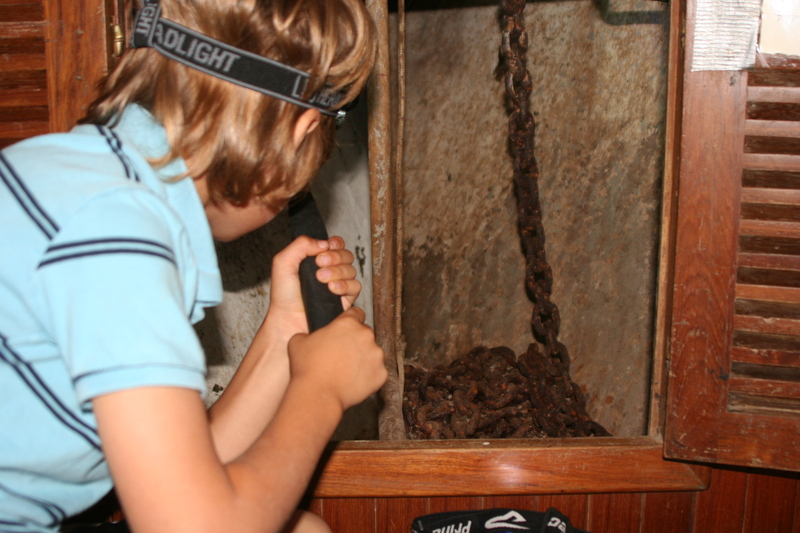 The anchor and anchor chain is located in the front of our berth at the bow of the boat. 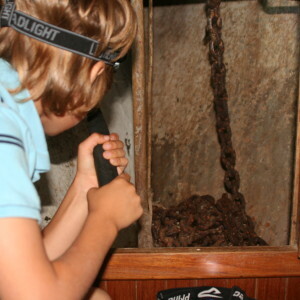 Much of the chain was rusted together and had to be broken apart with a hammer to loosen it (Malachi helped with this). It took most of the morning and part of the afternoon to haul out 300 feet of rusted anchor chain and pull it onto the dock (Joshua helped with this). Matt hurt his back early in the process so it took a bit longer than anticipated. We had a quick lunch and then some quiet time (Joshua usually naps during this time and Malachi devours books. I am not kidding when I say ‘devour.’ I gave him a 465 page-book, The Search for Wondla, thinking it would keep him busy for weeks. He read it in less than 48 hours – he does not so much read, as inhale, books. Thanks Ms. M for instilling a love of reading!). During the morning there were various trips to the bathroom at the marina (Modern Convenience #3: bathrooms in close proximity). 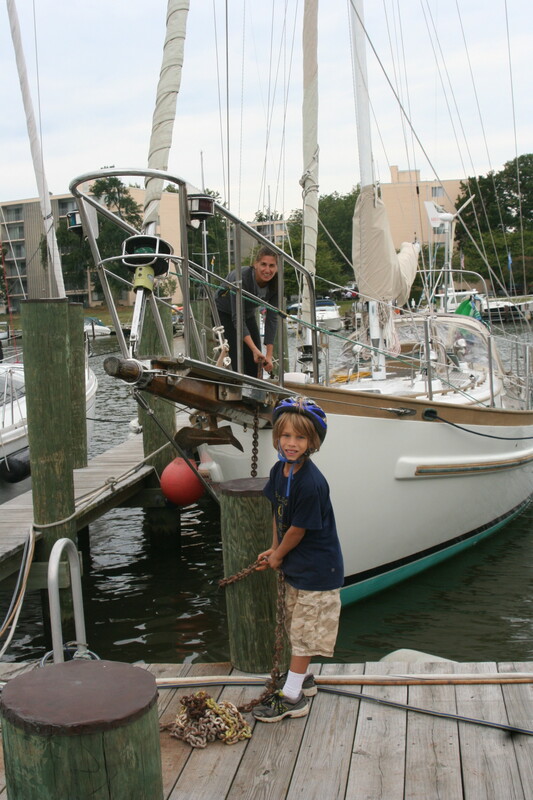 After quiet time, Joshua vacuumed all of the rust that had accumulated up on the deck as we hauled up the chain through the windlass. I scooped out about 3 pounds of rust from the anchor compartment and then vacuumed what was left. Malachi helped to clean up the vanity sink in his berth and then vacuumed some of the floor in the cabin while Joshua wiped down his berth. We then hung the rags on the boat lines to dry (Modern Convenience #4: a washer and dryer in one’s domicile). Because the stove on the boat is not yet functional (Modern Convenience #5), I prepped some vegetables to cook on one of the marina grills. While Matt was grilling, I washed the dishes (Modern Convenience #6: dishwashers!). During this process, I ran out of water because the water tank ran out (Modern Convenience #7: an unending supply of water) so we had to get the hose off the deck and re-fill the tank for 20 minutes. I finished washing the dishes in cold water (Modern Convenience #8: hot water! I have to boil it on the stove if my hands are too cold. We only have hot water when we run the engine, which we generally only do on days that we sail). After lighting a citronella candle to limit mosquitos on the boat, we had dinner. Matt then took the boys to the marina to use the bathroom and we brushed and flossed their teeth, read them a story and put them to bed. I closed the hatches to ward off the night chill (Modern Convenience #9: a heating system) since Joshua’s lips were a little purplish at breakfast. Since internet access is slow and sporadic (Modern Convenience #10: constant and fast internet access) and the boat is small, Matt and I generally go to bed between 9 and 10 pm. The interesting thing about all of this is that, because things take so much longer, I find I am just ‘in’ whatever I’m doing. There is no rushing to the next thing because the pace of life is necessarily slower. In that way, it’s kind of nice – it feels like I’m more aware of life as it happens. 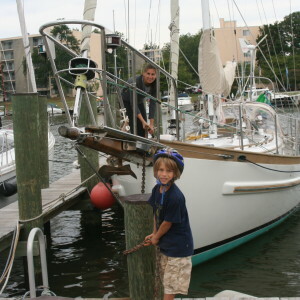 This entry was posted in Life on the Boat on September 30, 2013 by Diane.